Is this supported by AUv3 official specs or is it something DDMF came up with on their own? Hopefully the former! What is that? Yes, I know, it's not "Arturia". But what does it mean "2-channel version"? I guess it is something that is there in the AU sdk available for developers to implement. Like there's some useful IAA stuff that I have only seen Kymatica implementing in his apps. @Kranick this usually means that on a stereo channel-strip you can treat left and right channel independently from each other.In other words like 2 mono channels. 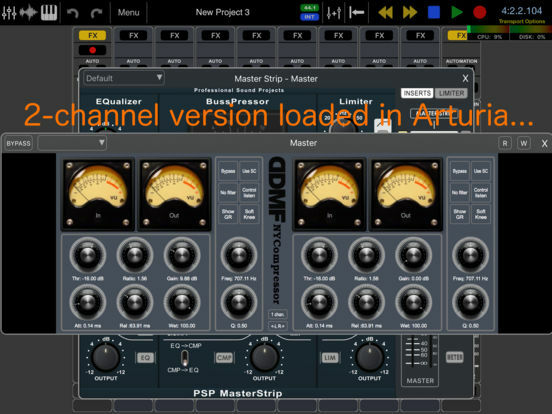 Yes, it's in the AU specs, effect plugins can have more than 2 channels. Not sure which/how many AU hosts support this, though. Can't offer any compressor expertise, but will note the Gain works really well. And using multiple instances seems a good way to apply more gradual compression - but look forward to what others write. Small gripe here, but what happened to this developer's app icons? They used to look kind of cool, and inform you of what they were, but now they are generic and honestly look like a mistake. In fact two of the apps have the same icon. How taxing is it on resources? So, does it do sidechaining or not ? Anyone any luck? Demo video ? I'm also very curious whether you can do sidechain when using it as an AUv3. Also, i'm curious if there's any added latency when used in live playing? Good luck! I'm sure it will eventually be supported by some hosts but I also know how long these things take and I'm afraid I lack the patience... I still hope someone tells us that it works and how. I will agree about the terrible app icons. Even though the older ones were bad too, at least they had the DDMF brand on them. this might actually replace auria completely if it works. anyone manage to get sidechaining to work in AUM ? Re: sidechaining, it uses an internal sidechain with 3 filter types, frequency and Q adjustments. No external sidechain input can be found anywhere on the premises. Hopefully that will come at some point in an update. 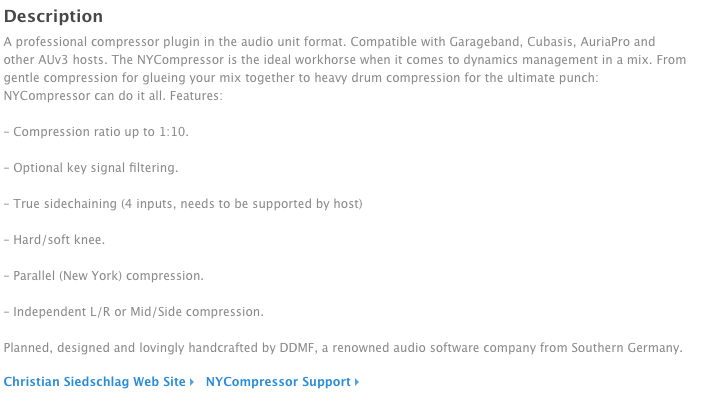 That aside, it's a nice compressor to have in the AU arsenal. Where it shines IMO is in M/S mode (below). 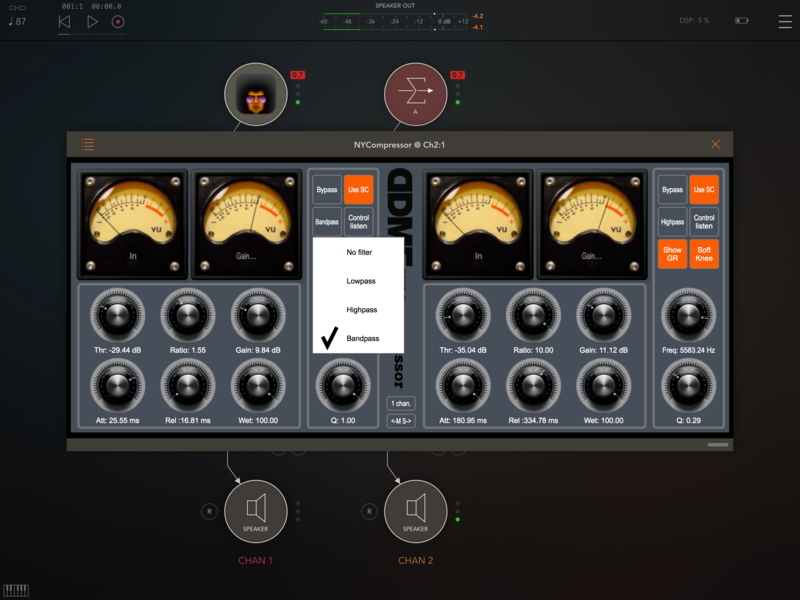 You can dramatically effect / enhance the stereo width of your source material using this mode. Also effective for general compression housekeeping, sample cleanup, drum break smashing, etc. And, as its name suggests, it's quite effective at parallel compression duties. 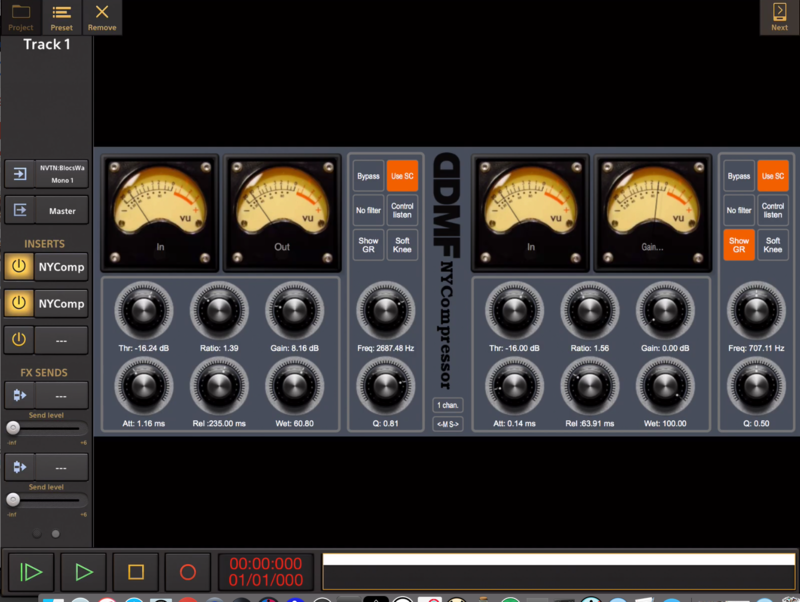 Usually in audio production what something looks like means little but I agree with the DDMF's icons. At least the Neve inspired EQ 6144 still has a decent icon, but the Envelope reverb and the newer limiter & now compressor have really generic ones. Yeah it's an extremely small issue in the big picture, but I think some potential customers​ may see the icons & equate their cheap appearance with the apps quality. Plus I'd want the apps I made to have a cool icon, it being such a basic identifier. Multi-bus AUv3 support in AUM is on my todo, but so far I know of no AU that uses it (which makes sense when no host supports it). AUFX:Push will, when I make an AU of it..
^ I enjoy the hell out of these sentences. Particularly the 2nd of the two. It actually makes a difference in AUM, where the effects icons are on full view on the main screen. The icon is the only real indicator of what the app is, so having two apps with the same icon is a problem. Yeah I guess technically that still means little, but it's an easy fix too. Fully agree. If you make heavy use of AUM then you become acutely aware of app icons. I'm not opposed to the simplicity of DDMF 's latest app icons, I find it refreshing in large sessions. But some clearer distinction would go a long way. NoLimits and Envelope use the exact same icon. Thankfully this compressor is at least a different color. And I'm not sure where this myth came from that in audio production the way something looks means very little! 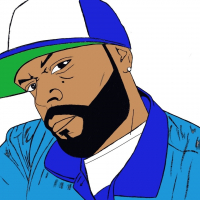 @JRSIV The way something looks translates directly to how you interact with that thing. And when you spend 12 straight hours interacting with that thing, and other things like it, the way it looks is actually very important. If you don't believe me, open Korg's Polysix plugin on a 5K iMac and then try and program a sound. It adds up! Personally I couldn't give two hoots about the icon. Otherwise I don't care about the icon design is what I mean. Anyway, looking forward to hearing more use reports from these apps.